The Dunwoody Wildcats improved 23 strokes on Day 2 of the Class 6A State Tournament to claim 10th overall. The Dunwoody Wildcats improved their first round total by 23 strokes in second round play to claim a 10th place finish in the Class 6A State Golf Tournament at the Chattahoochee Golf Club in Gainesville. Sophomore Jackson Perry led the way for the Wildcats as he cut five strokes off his first round 74 to put up an impressive 69 and finish with a 143 total good for seventh place overall at one-under par. Senior Will Bentson trimmed six strokes of his first round 79 to post a 73 to finish in a tie for 41st with his 152 in the tournament. Fellow senior teammate Davis Brainard knocked two strokes off his first round 78 to write in a 76 for a 154 total and a tie for 52th in the standings. Junior Ben Warren shot a second round 76 to improve by three strokes over his first round 79 to finish in a tie for 55th at 155. Patrick Caiaccio, another Dunwoody junior, improved an impressive nine strokes from his first round 86 with his 75 for a 161 total and a tie for 77th. Junior Cole Pickering shot an 81-83—164 to finish in a tie for 85th. The Chamblee Lady Bulldogs finished fifth in Area with a team total of 322 to qualify for the Class 5A State Tournament and brought home a 15th place in the team standings with a two total of 682. 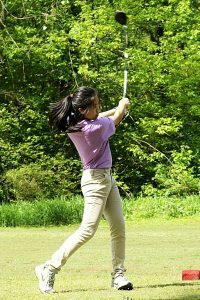 Sophomore Tiffany Li shot a 105 on the opening day and bounced back with a 101 in the second round to finish with a 206 total and in a tie for 34th in the individual standings. Freshmen Maxine Martin (114-115—229) and Kristen Nwadike (127-120—247) rounded out the scoring finishing tied for 49th and in 55th, respectively. 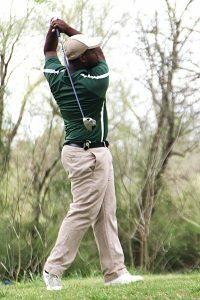 Arabia Mountain’s Nylan Washington became just the second Ram to reach the state tournament as he qualified with a second place finish 78 in the Area 3-5A boy’s tournament. Washington, a four-year member of the Ram team, shot a 79 on the opening day and a 78 on the second day to put up a 157 in the Class 5A State Golf Tournament. His total was good for a tie for 24th in the individual standings.